The next stop in our Mount Kenya trip was Safari Club, a picturesque resort in Nanyuki, with vast green lawns and Mount Kenya range in the background. Regardless of my silent prayers, the clouds were not allowing us a view of the highest peaks. Our destination was the Mount Kenya Animal Orphanage inside the property, where many animals have been rescued from injury or ill-treatment. Adi, loaded with two toy cars (cars and he are inseparable even in sleep) went in with us, fully charged to “see animals”. The first animal that we met was a caged caracal – a medium sized slender muscular cat with noticeable black ear tufts or tassels; its name in Turkish (karakulak) means black ears. It is believed that the ear tufts help to camouflage the animal in tall grass. However, the most widely accepted theory is that the cat twitches the ear tufts as a means to communicate with fellow caracals. These agile cats are known for their amazing jumping abilities, leaping up to 10 feet (3 meters); they will even leap on a sitting ostrich! The caracal was once tamed and trained for bird hunting in Iran and India (called syahgosh in Persian meaning black ears). They were put into arenas containing a flock of pigeons, and wagers were made as to how many the cat would take down. This is the origin of the expression "to put a cat amongst the pigeons." The caracal is capable of leaping into the air and knocking down 10-12 birds at one time! Our cat was licking his lips after a satisfying meal, wonder if it had pigeons for lunch today. The next animal we met was an antelope named bongo, near extinct from the region. Bongos were moving around freely and were open to being patted. It is incredible how many types of antelopes I have seen in the past one year. This was a new one – bright chestnut coat with thin vertical white stripes, with a hairy crest running from shoulders to rump – the hair on the crest alternating between chestnut and white as well. The orphanage has a bongo breeding (and reintroduction into the wild) program and bongos have been gathered there from several zoos around the world. There was another antelope nearby – a bushbuck – a small antelope with brown coat and white spots on the face and body, and white patches on the throat. Adi was encouraged by its small size and felt brave enough to move freely around it. Both bongo and bushbuck, not seen in savannah grasslands, are primarily browsers and only occasional grazers. I realised the difference while writing this piece; grazing means eating grass and browsing means eating twigs and leaves from trees and shrubs. And on the same lines, it was only few months back that I realised deer and antelope are not synonymous. Antelopes are natives of Asia and Africa; while deer species are widespread except Australia and Antarctica. Antelopes have horns those are permanent (made of bone with a keratin sheath, as part of skull), ever growing starting from few weeks after birth, neither branched nor forked. Deer (plural of deer being deer) have branched antlers (made of protein and calcium), which are shed every year and grow back next season. Among deer, only males have antlers in all species except for the reindeer, in which both sexes have them. Among antelope, in some species both sexes have horns, such as wildebeest, and in others only the males do, such as impala. We passed by a bunch of hyraxes; a grey crowned crane; even a strutting Indian peacock (that surely cannot be indigenous, there is an African Congo peafowl though - certainly not as pretty as the Indian one); an Egyptian goose sitting over her eggs, almost merging with the ground - a local guide later told us that she had to protect her eggs from her own children from previous cycles! We thought we had seen all that was to see and were just about to leave, when a fellow visitor was kind enough to tell us that there is another section (hardly visible, separated by a small gate) of the orphanage with more animals. We would have certainly missed some unique moments if not for her. We went inside the gate and found somebody to guide us at last. And who else do we see inside – half camel, half sheep like creatures with long necks, erect curved ears, large doe-like eyes, woolly coats - a group of llamas! How can I forget Captain Haddock being spit by a llama in the Tintin adventure “Prisoners of the Sun” – but was it not in Peru? The guide cleared the confusion – the llamas had been brought to Kenya from South America, a gift from somebody to help with mountain climbing, especially for children. The llama is a hardy animal, well adapted to surviving at high altitudes. It’s cloven (divided into two) hooves make it surefooted, adept at negotiating steep, rocky trails. And who was with the llamas – a lone wildebeest, which considers one of the female llamas to be his mother and is always by her side! Next we saw two caged male cheetahs, idling away – they had been brought especially to mate with a female cheetah, who did not find either of them worthy of her, leaving the caretakers baffled as how to proceed further! While this was an example of female having her say, the male surely reigned supreme in the case of ostriches. Initially the brown coated female was being fed by the guide, and then came the black coated male relegating the female to the background; humble servant watching from a respectful distance while His Highness savoured the delicacies. The guide told us that we could go ahead and feel the pointed black and white banded quills of an African crested porcupine – the largest porcupine on Earth. I did not feel at all up to the task, although it was keeping its quills very flat. I had absolutely no doubt that the moment it feels threatened, it will arch its back and the extremely sharp barbed spines on head, nape and back will leap to attention. Porcupines grow new quills (modified hairs coated with thick plates of keratin) to replace the ones they lose (for example detached when embedded into attacker). The average porcupine has approximately 30,000 quills, which average 5cm in length, African crested porcupine’s quills can be 35 cm long! As a defence mechanism to let the attacker know about its quills, it vibrates specialised quills that produce a characteristic rattle (the hollow rattle quills serve as musical instruments and were once used as containers for gold dust). If an enemy persists, the porcupine runs backward until it rams its attacker. The reverse charge is most effective because the hindquarters are the most heavily armed and the quills are directed to the rear. Once their barbs embed in the skin of their attacker, they expand, forcing the quill deeper into the attacker's flesh. The name "porcupine" comes from combining the Latin for pig (although porcupine is not related to pig at all) and French for spine, hence the nickname "quill pig" for the animal. They have strong, armoured tails as well which they thrash about to hit a potential predator. Porcupines are rodents, so their teeth grow constantly to help them chew through almost anything. To keep them from growing out of control (in other words to ensure tooth attrition), they have to eat non-stop! Our guide was quick to point out that it was a porcupine, not a hedgehog – which indicates that most of the tourists like me are unaware (or was unaware then) of the differences between the two. Porcupines and hedgehogs (the latter is much smaller of the two) are not even related. A hedgehog's quills (compared to a porcupine's) are very dull and are not barbed and not dangerous at all. They have around 7000 quills which average 2.5cm in length. In short, if you need a prick, pick the latter any day. We had seen a few tortoises on our way, though we did not pay much attention to them. We often forget how extraordinary animals are these – roaming the Earth for a very long time, dating back at least 200 million years, which means they shared the planet with dinosaurs. But what came next certainly caught our attention - a more than hundred years old giant tortoise, named Speedy Gonzales. This tortoise is probably not native to Kenya but has lived at the orphanage for many years. When the guide called out, Speedy obediently stood up – lifted his body up on raised legs, happy to give a ride to his guests, his back certainly can accommodate adult humans! We were marvelling at nature’s creations all this while, and then we came face to face with a creation which had man’s intervention striped all over it – a zebroid; black zebra stripes on a horse's brown body, even the brown horse ears were striped – a cross between a male horse and female Grevy’s zebra (a zebra found north of the Equator in Kenya with thinner stripes as compared to the plains’ zebra which is found south of the Equator). It seems the zebroid was bred by a hunter who wanted the perfect pack-animal. The hybrids have certain advantages: they are more resistant to certain diseases, such as sleeping sickness, than horses or donkeys (it is believed the stripes confuse the flies in zebras); can be domesticated like a horse or donkey; usually unlike zebras have withers (ridges between the shoulder blades) which help the saddles to fit. On a later visit to Nairobi National Park Animal Orphanage, we have also seen a zedonk – a zebra cross bred with a donkey. One thing is for sure, zebra hybrids are far more handsome than mules. The unforgettable parts of the trip came from the monkey section of the orphanage. Like in the case of antelopes, the fact that there are so many different primate species - has to be seen to be believed. The trip proved to be a continuation of that eye opening journey when a group of Patas monkeys greeted us from their cages. This is probably the grumpiest looking monkey that I have ever seen – brown body, shaggy white hair in the face and chest, eyes like black goggles, big round black nostrils and black drooping lips. A monkey that is known by many names: "military monkeys" or “Sergeant-Major monkeys” due to their smart brown coats, erect posture and solider-like white moustaches and whiskers; “dancing monkeys” because they raise all four feet off the ground to express pleasure or excitement. Looking at their cheeks, it is not possible to guess that these monkeys can hold as much food in their cheeks as they can in their stomachs (may be I should have been looking at their lean stomachs). The Patas monkeys are the most ground-dwelling and fastest of all primates, running at speeds of up to 55 km (34 miles) per hour - at a distance, a running Patas can sometimes be mistaken for a cheetah due to its speed! They have slender bodies, long limbs and short digits which are adaptations that enable them to run at that speed. They walk on their fingers, not on their palms; quadrupedal terrestrial movement rather than arboreal movement. As a result they have not been affected by deforestation in the same way as many other primates. They may look nasty, in reality they are an exception to the rule of big, aggressive Old World (Africa, Europe and Asia as against New World or Americas) monkeys, the Patas will run away rather than fight. When relaxed, they actually lean back and put up their feet. None of them were relaxing in front of us; on the contrary, they were alert to what our guide had brought for them; experience would have taught them the direct correlation between tourists and food. There was another monkey species that I saw for the first time – a very adorable one with grey coat, lively eyes, Captain Spock like white ears, bushy eyebrows, white muffler and a long tail - called the Sykes monkey. Our guide threw corn at these caged monkeys, and here again the others watched expectantly while the dominant male expertly caught each thrown bit and fed first. But there were baby monkeys outside the cage who were not to be bound by protocol (of course inside the cage would be a different story). They hovered near us in search of food. To reach to the guide’s hands that held corn, all of a sudden a baby Sykes monkey jumped on my shoulders catching me completely off guard and starting off a peal of laughter from the gathering. After that there was no stopping the baby monkeys - in search of corn, they jumped on everybody’s head and shoulders. When Bulbul started to feed one of them, it climbed up her hand, to her head, grabbed her sunglasses from there, ran off and climbed over a cage out of our reach, sitting just at the edge. The guide tried to coax the fellow to part with it. Not paying any attention to the guide’s requests, to our utter amazement, it tried to wear the sunglasses over its eyes - again and again unsuccessful every time. The glasses fell off in one such attempt, whence it could be retrieved. The monkey jumped down on Atanu’s shoulders to capture the glasses back, but we were smarter by then – everybody holding tight onto sunglasses and caps. It was not the end of the story - the baby monkey had eyed the car in Adi’s hand by then. Soon there was a tussle for the car – by babies at both ends, none letting go; which lasted till I put an end to it by shooing the monkey away. Need less to say, the car became super precious for Adi for the rest of the day; he would not relax his grip on it even for a second. My monkey discovery goes on as I saw three more previously unseen monkey species at Nairobi National Park Animal Orphanage on a later trip. The first one was De Brazza’s monkey, named after Italian-French explorer de Brazza; the same explorer who founded the Congolese capital, Brazzaville and the French Congo. De Brazza's monkey has a funny face with an orange crescent-shaped forehead backed by a black band (appears as if it is wearing a cap) and white mouth and a flowing white beard. These monkeys are comfortable in many different habitats: they dwell in the trees as well as on the ground, and are reported to be excellent swimmers (never thought a monkey could swim, but apparently these do). As guenons (a monkey classification) like Patas monkeys, De Brazza's monkeys have cheek pouches in which to carry food while they forage. The word “guenon” means ‘fright’ in French. When De Brazza’s monkeys are frightened, they freeze to avoid detection, and have been observed to remain unmoving for up to eight hours! The second one was a lesser spot-nosed monkey, incidentally another guenon and a rare one in East Africa. One look at the monkey (if you did manage to get a look that is, since it is the first cage in the orphanage and hence attracts the maximum crowd attention) and you know where it gets its name from - a bright white mark on the nose. The white spot is believed to help out spot the face in the surrounding greens to facilitate communication - they jerk their heads in different positions, each of which is supposed to mean something specific! 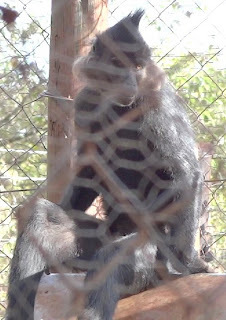 The third one was a black crested mangabey (again not a resident of East Africa) – black slender monkey (often called “the ones with the thin waist”) with a tail longer than the length of the body, grey outward curving cheek whiskers and a head that has a crest – in the shape of a conical hat or a spiky hair. The name mangabey comes from the port city of Mangabe in Madagascar. It was a comical sight (probably tragic from its view point) - rest less all throughout, pacing up and down the cage, rotating its head around the neck from time to time. Even within the constrained enclosure, it was easy to gauge its jumping abilities. Their preferred habitat is a closed canopy where they leap great distances from branch to branch and tree to tree in search of food. Adi remembers the Mount Kenya monkey episode very well. Till date, whenever he is with his cars near monkeys, he will check first whether the monkey will come to take his car. And as luck would have it, he would be in a tussle with a Sykes monkey again, this time over biscuits – but that’s a story for another time. Dear Arpita, I am a researcher in the USA and I would like your permission to reproduce one of your photos in an article. I am struggling to find your email - would you mind contacting me at njdominy@gmail.com, please?